Cataracts form slowly inside of your eye in the lens, which sits behind the colored part of your eye. As we age, this clear lens becomes more yellow and cloudy. Most cataracts are the result of chemical changes in the lens from aging, but can be brought on sooner from UV exposure, trauma, some medications, and certain diseases. 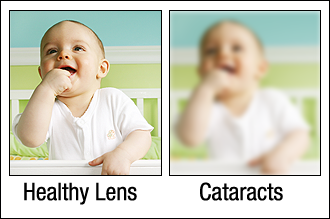 Cataracts can cause your vision to seem hazy or dim, make colors seem washed-out, cause glare and haloes around lights when driving at night, or rapid changes in your glasses prescription. When your cataracts are bad enough, we will refer you to have them surgically removed. This surgery has made many advancements over the years, and you will go home the same day as surgery. Your natural lens is removed, and replaced with a new, clear artificial lens. Many different prescriptions can be made in the artificial lens, so most people are much less dependent on distance glasses after surgery, though you will likely still need reading glasses. There are even specialty implants that correct astigmatism. Occasionally, people develop “after-cataract” or “secondary cataracts” after their initial surgery. This is not a new cataract, but actually a build up of a membrane on the back surface of the artificial lens implant. This may cause blurry or cloudy vision, but is fixable with a quick, painless laser procedure called a YAG. This simply removes part of the membrane over the area you look through, and most people see better immediately afterwards.